Georgie Fame, born Clive Powell in Leigh, Lancashire, June 1943 is one of British R&B music’s founding fathers. Fame is the only British star to have scored three number one hits with his only Top 10 chart entries - 'Yeh Yeh' in 1964, 'Get Away' in 1966 and 'Ballad of Bonnie and Clyde' in 1967. But it’s more important to acknowledge his cultural influence. Fame popularized and educated in equal measure. The black music he championed with his band The Blue Flames brought new sounds to Swinging London and bossed venues like the Flamingo Club and the Marquee where he turned the English mod movement on to a whole bag of soul and authentic US urban and country sounds and also the ska and early reggae he heard in the Jamaican cafes and clubs in the Ladbroke Grove area of London. Like his great friend and collaborator Van Morrison, Georgie Fame found himself raised on jazz and blues with a penchant for Mose Allison and Willie Mabon and of course Ray Charles, not to overlook a grounding in the sophisticated rock and rollers like Chuck Berry who defied categorization. With Latin pop also part of his skill set, Fame can turn his hand to just about anything and since his piano and Hammond organ keyboard brilliance – he is also a fine guitarist - is matched to a gorgeously relaxed vocal style he takes audiences on a melodic journey that combines the sweetest nostalgia with the most up to date interpretations of great songs and songbooks. As a sideman, he has recorded with many artists, including Gene Vincent, Prince Buster, Muddy Waters, Eric Clapton, Joan Armatrading, Andy Fairweather-Low, Bill Wyman and Van Morrison. Ever on the road, Georgie Fame continues to perform his unique blend of jazz/rhythm and blues for live audiences at clubs and music festivals throughout Europe. He is revered in Scandinavia and Germany and even took a local version of the Blue Flames to Australia where he escaped the English winter and built a rapport with fellow players from another hemisphere. Having taken piano lessons at an early age the man born Clive Powell in the cotton weaving area of Leigh, Lancashire became a professional musician in the 1950s playing at holiday camps before departing to London aged 16 to seek his fortune. He touted his talents up and down the legendary Tin Pan Alley area of Denmark Street just off Soho where he was spotted by impresarios Lionel Bart and Larry Parnes who christened him Georgie Fame – somewhat against his will. Working with touring rock and rollers like Joe Brown, Gene Vincent and Eddie Cochran young Fame became battle hardened and was snapped up by Billy Fury in 1961 to lead his backing band The Blue Flames for whom he arranged and sang. The Blue Flames and Fury parted company and so Georgie took over and secured a three-year residency at the Flamingo Club. The debut Rhythm and Blues at the Flamingo came out in 1963 and was engineered by Glyn Johns and produced by Cliff Richard’s console maestro Ian Samwell. After promoting himself via the offshore pirate radio stations Fame struck gold with his version of “Yeh, Yeh”, a tune first recorded by Mongo Santamaria in the Cuban style. The next significant hit, “Get Away”: was another #1 in 1966 with production from Denny Cordell and a Clive Powell writing credit. The perfect sound for the emerging summer of love with its carefree mood “Get Away” also did well for Georgie in America where Imperial signed him. In 1967 Fame followed the Beatles’ “Hello, Goodbye” to the top slot with the million selling “The Ballad of Bonnie and Clyde”, inspired by the then current movie. Using an authentic depression era arrangement, banjo, trumpets, trombones, bass and drums, Fame made a smart career move by shifting himself away from the pin-up status he had grown tired of and headed towards mainstream entertainment as a solo artist with high class material like “Sunny”, “Peaceful” and “Seventh Son” ushering him towards the new decade as a household name rather than a straight forward pop star. He was back in the charts in 1971 thanks to the super catchy duet “Rosetta”, recorded with his old friend Alan Price, and the two kindred spirits shared a career path for a while until George reformed The Blue Flames and then took to working with classical orchestras and big bands, writing jingles for TV ads, and theme music for TV shows and feature films. His excellent contribution to the movie adaptation of Joe Orton’s Entertaining Mr. Sloane gave him extra kudos. Georgie is such a prolific artist that it would take several books to deal with his catalogue adequately but there are many key moments: Sound Venture (1966) is a jazz pop crossover with a crack horn section and a sound that was a definitive influence on the young Elvis Costello. His self-titled debut for the Island label in 1974 is a marvellous thing with covers of J.J. Cale’s “Everlovin’ Woman” and the Slickers’ “Johnny Too Bad” bookending his talents. The Sonet release Sylvia Vrethammar and Georgie Fame - In Goodmansland is a gem from 1983 and the Verve issued Tell Me Something – The Songs of Mose Allison (featuring Van and Georgie, Mose and Ben Sidran) is a classic worthy of discovery as is How Long Has This Been Going On (Georgie, Van and various friends). In the new millennium we point you towards Sweet Things, part of the British Beat 40th anniversary series. Hear Fame pour his magic over Lee Dorsey/Allen Toussaint’s “Ride Your Pony” and Willie Nelson’s “Funny How Time Slips Away” and then dig his take on the soulful beats of “Walking the Dog”. If you’re after a fine compilation then 20 Beat Classics has what you need with fantastic interpretations on “Green Onions”, “Sunny” and “Papa’s Got a Brand New Bag”. The collection called Funny How Time Slips Away documents Georgie’s Pye Records tenure and is remastered and full of quotes from the man himself. Always the coolest of the cool, Fame continues to perform today, having recovered from illness we are pleased to say. He appeared recently reprising “Yeh Yeh” on the Wallflower (Deluxe Edition) with Diana Krall, thus bringing his immaculate career full circle. 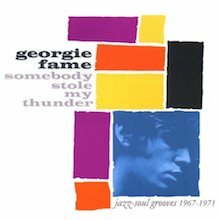 A matchless interpreter of swinging jazz vocalese (check his 2000 release Poet in New York) Georgie Fame can take you everywhere from a Gershwin tune to a Bob Dylan protest. He remains a most vital and respected first gentleman of contemporary music. Georgie FameFame, born Clive Powell in Lancashire in 1943, had been developing his talent since the late 1950s, backing various British pop artists and opening for Gene Vincent and Eddie Cochran on a 1960 UK tour. His group the Blue Flames started making their name as a big live attraction and were on record with EMI from 1963. 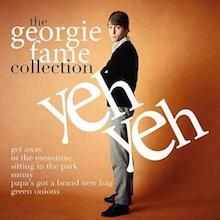 By the time ‘Yeh Yeh’ hit big, Georgie had already made his album chart debut with ‘Fame At Last,’ in October ’64. Fame’s recent appearance on a remake of ‘Yeh Ye,’ included as a bonus track on Diana Krall’s current album ‘Wallflower,’ was a timely reminder of his unique place in UK music history, captured on this new retrospective. It was 1985 that Georgie Fame (my surrogate brother) called to ask if I would be interested in a project that he and Steve Gray(d) were writing for radio in The Netherlands. If I agreed they also wanted me to be the 'mannequin' on which they could hang the story. The studio recording with Het Metropol Orkestra was never released and we were lucky to perform the mini-opera in 2003 in Tilburg, NL. In May 2012 The Jazz Orchestra of the Concertgebouw said "let's do it!" This project dates back to 1984 when Georgie Fame and Steve Gray performed a concert with the Metropole Orchestra for Dutch radio. The following year they began to write a new work. 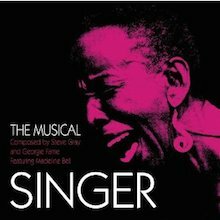 Georgie, who wrote the lyrics, was to be “the narrator”, Madeline Bell (‘I’m Gonna Make You Love Me’, ‘Picture Me Gone’) the singer, and Steve Gray who wrote the music the arranger. The piece was reprised with this live concert version part of that process of revival, and recorded in Tilburg in January 2004, with the Metropole Orchestra and Jody Pijper Singers conducted by Johan Plomp. Steve Gray died in 2008 and his succinct words on ‘the book’ behind the libretto act as a sleeve note, describing the story of Singer, a gospel-singing star in the making from small town southern-state America who sings jazz with local bands but who is attracted to the wrong kind of man. This “true story” continues when the singer moves to the big city, fame strikes but she ends up singing the sort of music she doesn’t value and keeps jazz to after-hours. She’s happy for a while but knows she’s sold out. In the course of the tale she’s given a second chance but her dilemma is whether she will take it or not. ‘Prelude (The Game of Life)’ opens the album with a beautifully rendered after hours kind of piano ballad number that opens into a trio setting straight out of a dream before the piece scales up with the orchestra. The sunny ‘Small Town’ sung by Fame bristles with a blues-rock guitar solo that gains some traction and develops into a fun show number. Then Bell’s uplifting ‘My Second Home’ following brings the mood down with atmospheric organ sending the piece into a 1960s-ish pop/gospel place. Fame sings the lightly swinging catchy title track that begins with horns and reeds and then Bell’s feature, ‘Learning’, has a lovely clarinet opening and the little optimistic motif from before returns. ‘Big Town’, the counterpart of the earlier ‘Small Town’, has more of an old school big band feel and the Metropole powers up for the first time. When The Ballad Of Bonnie & Clyde hit No 1 in early 1968, Fame found himself in ever greater demand on the pop and cabaret circuit, moving him further away from his jazz roots. But although he seemed willing to jump through the occasional glitzy showbiz hoop, there was still much evidence of what his long-term fans considered the “real” Georgie. This compilation sees Fame let rip on his Hammond B3 with gusto, from the mod-ish title track to the Ray Charles vibes of Seventh Son and Peaceful’s blissed-out shuffle. Never the strongest singer, the limitations of his laconic voice are nonetheless perfectly suited to the looseness of the music. That’s not to suggest there’s anything shambolic here; Fame always surrounded himself with the best musicians available, and his quality control and mastery of his craft keeps him in demand to this day. His on-off work with Van Morrison over the last decade or so undoubtedly helped invigorate an artist prone to the odd slip in standards. There’s much to admire in Fame’s more mainstream output, not least his work with fellow ivorytinkler Alan Price, but these 24 tracks represent the heart and soul of one of this country’s most cherished music makers.